1Choose Playlists from the Navigation panel in the Music app. You will see some options for your music. 2Tap the Create New Playlist button. Make sure you have thought about which music you want in your playlist. 3Type a name for the playlist, and then tap the Save button. Keep the name short and descriptive. After naming the playlist, you see the Add to Playlist screen, where playlist is the name of the playlist, such as 1990s. All songs available to your phone appear on the screen. 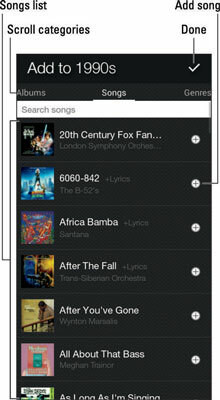 Swipe the tabs left and right to display the songs by artist, album, song, or genre. 4Tap the Plus icon (+) by a song to add it to the playlist. Repeat this step over and over to build the playlist. 5Tap the Done button to create the playlist. The playlist appears on the list of playlists, under the name you chose in Step 3. You can edit the playlist to modify it at any time. Select the playlist and tap the Edit button. Remove songs by tapping the Minus icon (–) next to the song; add more songs by tapping the Plus icon atop the screen. Rearrange the order by dragging up or down the tabs on the left end of a song. 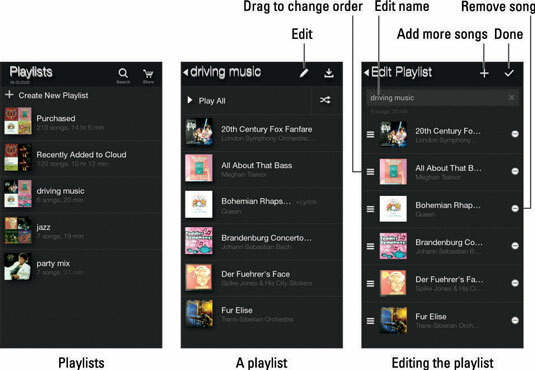 You can have as many playlists as you like on the phone and stick as many songs as you like into them. Adding songs to a playlist doesn’t noticeably affect the phone’s storage capacity. Removing a song from a playlist doesn’t delete the song from the music library. To delete a playlist, long-press its entry on the Playlists screen. Choose the Delete from Cloud command. Tap the Delete button to confirm, and the playlist is gone. This action doesn’t delete any of the playlist’s songs.